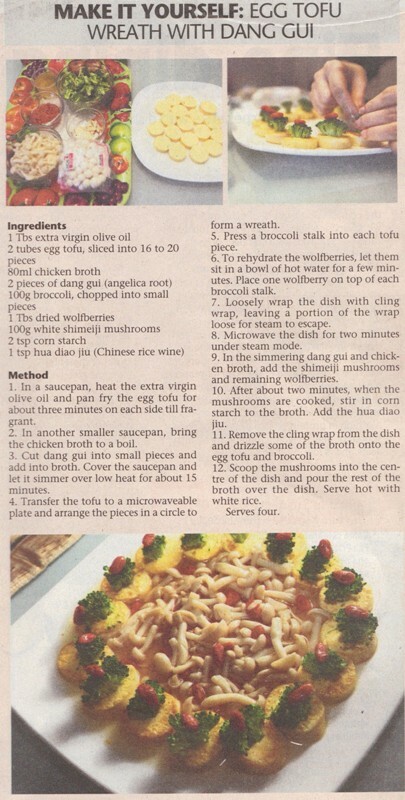 You are here:Home » Recipes » My Moment Of Glory In Singapore’s National Papers! 28 Aug 2011 was a special day for all Singaporeans. It was the day of the official announcement of our newly elected President – Dr Tony Tan! That day was especially meaningful for me because I was also in the papers! “Shirley occupied half the page in Straits Times!” shouted my good friend, Doris. She was more excited than me and posted the newspaper article in Facebook! That morning, I was inundated with phone calls and smses etc. Friends and ex-colleagues whom I’ve not contacted for a long time, suddenly “appeared” out of nowhere. It was a nice feeling indeed! I was thrilled and at the same time nervous, when I found out that the Straits Times team was coming to my home to interview me and try my cooking. The reason I was nervy because the stuff that I would be cooking for them mustn’t be published before. Gosh! That was really tough, as most of my signature dishes were already in my blog. I like the challenge though, to come up with something completely not in the market. I wanted to do something unique and different, fit for all races and ages. A brilliant idea popped up! Yes, I’d use Chinese herbs in my cooking. No, I won’t be making tonic. Instead, I’d be adding them into my dish; something not commonly prepared. I wanted to use – Dang Gui. English name: Chinese Anglica Root, which is a blood tonic. To pair with Dang Gui, I’d chosen Wolfberries, which is known to promote good eye-sight. I already had in mind what to make. Off to the supermarket, I bought Egg Tofu, Broccoli and Shimeji Mushrooms. I started creating a dish out of these ingredients. Coincidentally, we’d guests over for dinner that night. So it was perfect for a food-tasting session. The outcome was unanimous, everyone loved the new creation! Too bad we didn't take any pix; we were all too engrossed in our catching-up. The pix below was taken from my 3rd attempt, a mini version for a friend's birthday after the team came. I was ready for the big day. The Straits Times team came to my home, watched, photographed and recorded my every move. It was a nerve-racking 2hr+ of interviewing and food-tasting. 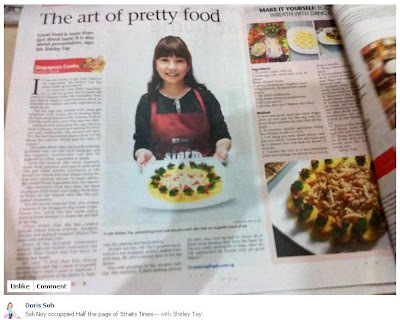 Thank God they liked what they saw and ate, and gave it a nice header "The Art of Pretty Food"! I’m really happy with my latest creation "Egg Tofu Wreath With Dang Gui", fresh from the oven. It’s not found in any cookbooks nor restaurants, anywhere in the world! this food looks awesome.....gr8 job...keep rocking! Congratulations! I am so happy for you! I am glad I come back to your blog. I am sure happy for you Shirley and you are looking good in the pic. That was a great recipe you made too. take care. Congratulation Shirley! The foods looks so tempting. Yummy yummy! Congrats once again! Indeed it's a rare opportunity to be feature in the national paper, and you have done a great job. Nice and unique recipe. Awww.... Congratulations, Shirley! This is such a great honour and a testament to your creativity and your passion! I am so proud of you. You truly deserve this and you look awesome in the photo on the newspaper! And another congrats for winning the Paint makeover challenge <3 This is truly a blessed month for you. OMG OMG, i'm so happy for you Shirley! To be featured in the newspaper, stuff dreams are made of! 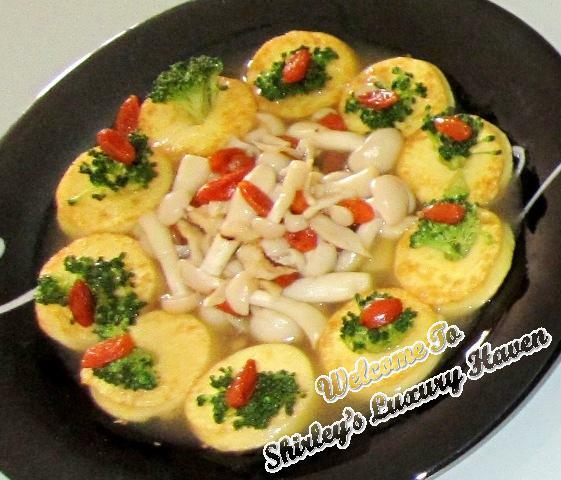 Shirley, how exciting! (GREAT photo, too!) Wish I could have been at the taste-testing party. :) Congratulations on this well-deserved achievement! P.S. I did not see your recipe (my computer has been acting up and it wouldn't show the last 2 photos either!) I was intrigued to discover that this was a baked dish. Definitely want the recipe! SHIRLEY!!!!!! My oh my what a thrill to be interviewed for 2+ hours and then featured in the newspaper! Yo go girl! Love love love the dish you made! I'm familiar with dang gui and wolfberries as the Chinese use those two ingredients for soup. What a beautifully presented dish and very creative as well! Will you be posting your recipe? I would love to see how this wonderful dish is made. You never cease to amaze me, my dear. Bravo on this very lovely and unique dish. Congratulations on being featured in the newspaper as well! Congratulations, what a great picture of you in the paper! Looking forward for more from our dear Shirley. Congratulation, so proud of you...i can tell my peers this lady once sat beside me in class! A BIG thank u to all of u who took time to leave me your warm wishes & heartful words! It's really encouraging to read all your comments! KF, I'll come up with more & u promise to cook some?? Hahaha! Isaac, hope my dishes will attract u to drop by more often. LOL! What a wonderful honor to be featured in a National paper! It does feel good to be appreciated for all your hard work! Congratulations! Oh congratulations sweetie...what a wonderful accomplishment! Natasha, thks for your well wishes! Alisha, I came a long way. LOL! I did it!! Thanks so much for visiting my blog and leaving me your sweet comments!I was just browsing your space when I came across this post - it is so wonderful to know of your achievement dear!The dish looks beautiful indeed and no doubt the guys found out the right person to honor:)Lovely to know and my belated Congratulations! Sudha, thks so much for your kind note! Pleasure mtg u in bloggersphere! Elin, thks dear! Hope u'll like it & Happy CNY to u too! Wow, we have a celebrity in our midst. Well done, Shirley. Wow, congratulations, Shirley! I'm sure it was nerve wracking, but you did a wonderful job! Liz, looks like both of us are having the same problem. Lol!